HARLEM — When she got nervous while playing at the United States Chess Federation's SuperNationals competition for students, 10-year-old Jayllyz Vasquez, a fourth-grader at Success Academy Harlem, took a deep breath and calmed herself down. "I'm not afraid of challenges," Vasquez said in response to a question from retired Russian grandmaster Garry Kasparov Wednesday on how students at the school benefited from playing the game. Kasparov told the students it was okay to be nervous, part of his hour-long discussion at the school about strategy and the benefits of playing chess. "If you don't feel nervous you don't care,' said Kasparov. "Everyone has fear, it's about how you handle it," he added. Though retired, Kasparov is considered one of the greatest players to ever play the game. He held the world's top ranking for almost 20 years and was the most highly rated player ever until recently. These days, Kasparov is involved in Russian politics and travels the world promoting chess through his foundation. He also tutored chess grandmaster Magnus Carlsen, who currently holds the highest competitive ranking ever. 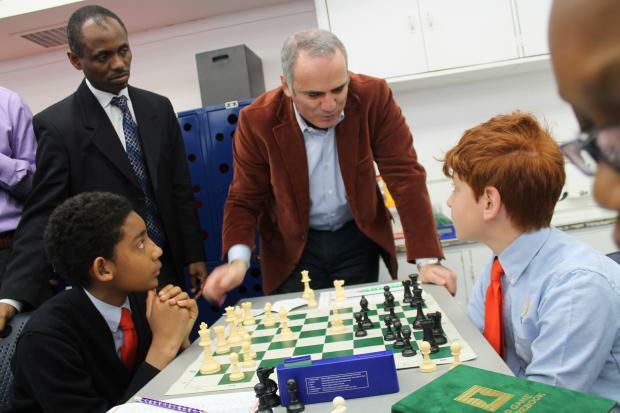 Just weeks after a team from Success Academy Harlem placed second in their division at the National Chess Championships, Kasparov visited the school to provide further encouragement. Students at Success Academy charter schools begin studying chess in kindergarten. In the third grade, they are eligible for tournament play. Almost 40 kids from five of the Success Academy schools competed in the national chess championships last month in Nashville, Tenn., with all placing in their divisions. Success Academy Harlem chess teacher Fritz Gaspard referred to Kasparov as the "Michael Jordan of chess" and said the kids were excited for his visit. "Chess requires you to do research to learn to play in certain styles. You may make an error that you have to go back and fix," said Gaspard. "Those things translate because there is not a thing in this world worth having that you don't have to prepare for." Kasparov said he's seeing a resurgence in chess in schools throughout the United States. Chess has innumerable benefits such as teaching kids how to learn from their mistakes, boosting confidence and teaching planning skills, he said. Unlike athletic sports such as soccer and basketball, chess shows everyone they can be successful on an intellectual level and is cheaper, Kasparov added. The students at the school peppered Kasparov with questions. One student wanted to know what Kasparov's goals were in chess. Being retired, he said he had already accomplished his goal of placing a gold championship medal around his son's neck. Another asked how to tell if their opponent was losing confidence. Kasparov relayed a story about his fourth world title match with Anatoly Karpov in Seville, Spain in 1987. One girl said chess had taught her to love complicated things. Another student said he applies chess strategy to his math work. "Chess can help them feel their future success is unlimited," said Kasparov.